Get more recipes by subscribing for free to the RSS feed or Monthly Newsletter. Let's Dig In! The first time I had a Chimichanga I was at a restaurant called Mexicali Rosa. I became an instant fan of the concept…wrap delicious ingredients inside a soft tortilla then fry it! 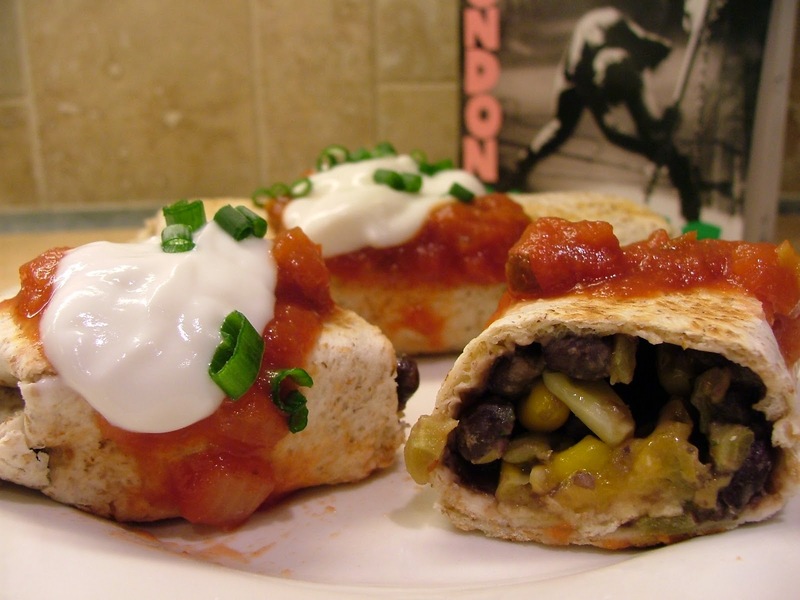 It inspired me to create my Sweet Potato Chimichangas which happen to be one of the most popular dishes in my cookbook and on this blog. This time, instead of using sweet potatoes as the base I switched it up and used black beans. This is one of those stand-by recipes. You can whip-it out on days when you need something healthy to eat and don’t want to spend a lot of time in the kitchen. For a musical pairing I suggest the Clash’s song “Rudie Can’t Fail”. I picked it for no other reason than you can't go wrong making Chimichangas whether your name is Rudie, Bob, Shelly, Larry or you’re preparing them with black beans, sweet potatoes, chicken or beef. The song also has a cheerful ska vibe to it making the cooking experience more welcoming! By the way if you’re having a tough day just say the word Chimichanga (with some enthusiasm thrown in for good measure). You’ll feel better than the moment before. Go ahead…give it a try. Ya see what I’m saying? Drain black beans, reserving 1 tbsp of the liquid. Rinse beans under cold water. In a large non-stick skillet, cook remaining beans, green chilies, corn and green onion over medium heat until warmed through. Add cilantro. Cook and stir for 30 more seconds. Transfer to a bowl and wipe out skillet with a paper towel. To assemble, spoon 1½ tbsp of bean paste evenly around one-side of a tortilla. Add 1/3 cup filling in the centre of tortilla. Sprinkle some cheese on top. Fold tortilla end, closest to yourself, over the filling just to cover. Fold the left and right side of tortilla towards the middle to enclose the filling. Fold over again, towards the top of the tortilla, to make a parcel. Repeat with remaining bean paste, filling, cheese and tortillas. In a large non-stick skillet, heat ½ tbsp of oil over medium-high heat. Place 4 filled tortillas, seam-side down in the skillet. Fry for 30 seconds to lightly brown the tortilla (they brown quickly). Turn over and fry for 30 seconds more. Remove tortillas from pan and place seam side down on a baking sheet. Repeat process with remaining oil and filled tortillas.